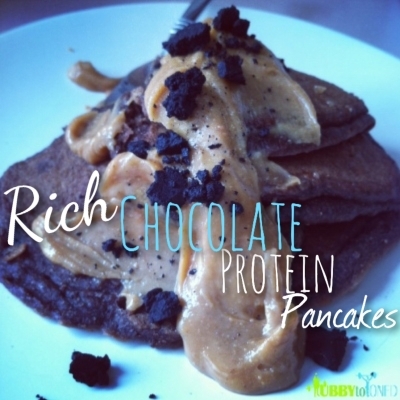 These rich chocolate protein pancakes are a Chuck Norris HIT to your taste buds without the ever annoying food belly. Heat coconut oil on a large skillet on low/medium heat. Sift together dry ingredients in a bowl. In a separate bowl, mix together wet ingredients. Add wet to dry. Mix slightly, there will be clumps and this is fine, you don't want to remove all the clumps of the batter wont turn out right. Cook pancakes until brownish on each side. Makes six 6- 7- inch pancakes, or ten 4-inch pancakes!